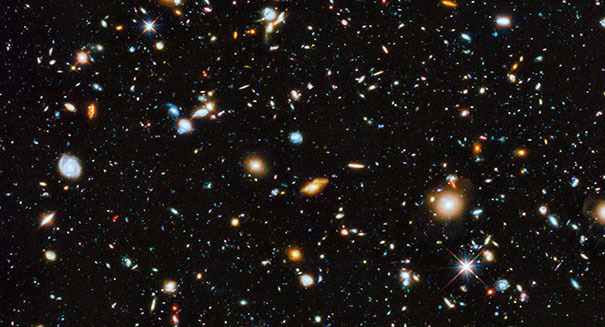 A new study has found that our universe is way more vast than we realized. The sheer size of the universe is already something that is difficult to comprehend, but scientists have just determined that there may be 10 times more galaxies in the universe than we originally thought: 2 trillion instead of 200 billion. That’s based on a new analysis of Hubble Space Telescope data, which marks the first major revision to the number of galaxies since 1995, when scientists last used Hubble to look at the sky for 10 days to create an image of the universe. Based on that image, scientists believed there were about 200 billion galaxies. But 20 years later, a new analysis suggests that we may be severely underestimating the size of the universe. The study was led by Christopher Conselice of the University of Nottingham and published in the Astrophysical Journal. The new study indicates that 90 percent of galaxies in the observable universe — just the universe we can see from Earth — are too faint or far away for current telescope technology, which is why the 90s estimate was so far off. The future arrival of the powerful James Webb Space Telescope will allow scientists to study these incredibly faint galaxies.